Sport often generates great stories of people rising above adversity. This is one such story, following the journey of a young South African from a dead-end path on the streets of Itsoseng to a scholarship in the South Australian Riverland and representing his country in Melbourne at the Australian Football International Cup. Tefo Benjamin Motuba, or Benji, grew up in South Africa's North West Province at a time when the apartheid era was coming to an end, but although freedom brought hope to many, the people did not receive economic salvation and the mission to raise the standard of living for all of the country's people will be long and difficult. Born in the small town of Itsoseng, where opportunities were few, Benji was the youngest in his family, and his mother supported them all as well as members of the extended family. Despite this she found herself homeless and for a time raising her children with only trees for shelter. After a short stay in Klerksdorp they returned to Itsoseng in 1990 and Benji began school. By just eight years of age he was skipping class and found himself mixed up in drugs and crime. It would be fair to say that his life was headed for oblivion. The one thing that saved Benji was sport. In his own words: "One day it happened that I found myself in the stadium when it was the school athletics. The teachers were calling the names of the schools in the tracks and one of the schools were not having a representative and I notice that and I get in the track with other children for 100m run. And I became first in that race and the teachers wanted to write my name and I told them that I don’t attend any school. They advise me to go to school because I have the great future and the only thing that can make my dream and future be successful is to attend the school". Benji's mother desperately wanted to see him get a good education, and he convinced her that he would do that if he could go to another school. In 1996 he started at Maokaneng primary and "from that day I told myself that I will educate myself and help my family". 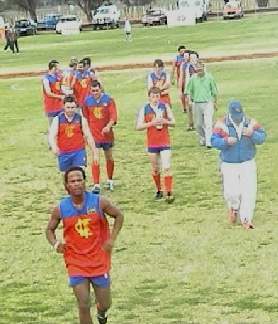 He soon began representing his school and province in running, but it was in 1998 when an Australian Defence Force group toured the area, introducing Australian Rules football, that the young South African found his calling. Soon the best players had been selected and were flown to Canberra for the Jim Stynes Cup, an Aussie Rules tournament to promote the game amongst juniors around the world (it has since become the Barassi International Australian Football Youth Tournament). To travel to Australia was an opportunity that the young boy from Itsoseng could not have dreamed of, yet two more trips would follow. With the help of the Sporting Coaches' Outreach program (SCORE), Tattersals and the AFL, Australian football has continued to grow through the AFL South Africa. In 2002 the inaugural International Cup was held in Melbourne, featuring eleven sides from around the world. Benji was selected and made his second international journey, representing "the Buffaloes" with pride. Ireland defeated Papua New Guinea in the final, while Australia did not compete as the other countries are still in the early development phase. Although the Africans went without a win, it was clear that bigger and better things were being planned. The Aussie Rules program has since been expanded to include Gauteng Province (which includes the large cities of Johannesburg and Pretoria) and plans are being made for Western Cape (the most well known city being Cape Town). As the development focuses on children, it may be a few more years before the results of this work is seen at senior level. A world away in country South Australia, Betty Lloyd's family worked a citrus orchard. She had visited South Africa many years earlier and it was well known that she dreamed of returning to make a difference, perhaps working in an orphanage. Betty and her husband Ray raised a family and also fostered many other children for varying periods. When Ray passed away Betty's friends assumed she would be inextricably drawn back to Africa, but instead she took over the farm to secure her family's future. All the while she was wondering how she could fulfill her African dream. Actively involved with her local footy club, the Lyrup Lions, one day Betty was surfing the net for graphics to help with the club's promotions, when she stumbled across the London Lions and San Diego Lions - Australian Rules football clubs in England and the US. Like many, she had no idea that the game she loved was now widely played overseas. So began her interest in footy beyond Australia's shores. In early 2005 a team of amateur footballers toured South Africa, and Betty joined the squad, videoing their three matches and three Auskick clinics. Originally one of her sons was to play, but the tour date moved and as irrigation manager he was needed on the family farm. Fortunately Betty still chose to go on the tour. 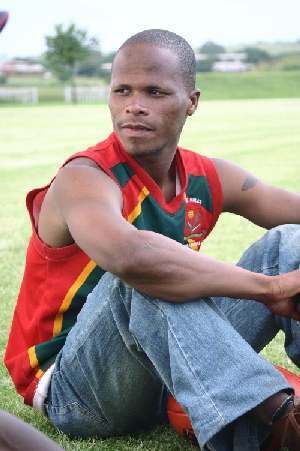 "The Convicts" played against sides representing North West and Gauteng Provinces, and finished against the South African national side in Soweto. Upon returning to Australia Betty heard that AFL South Africa were trying to send a player to Australia on a scholarship. She contacted CEO Steve Harrison and offered to host a player and Steve was delighted to begin a selection process. After visa delays and much hard work by Steve and AFL South Africa Chairman (and former Melbourne player and Victorian Minister) Brian Dixon, Benji Motuba was selected as an excellent candidate and was headed for Australia. Benji arrived in Adelaide in late June and travelled to Lyrup with Betty for the three month scholarship. He was quickly training and has begun playing for the Lions in the Riverland Football League. In his first game he played on the wing and was named fourth best in a narrow loss. The rollercoaster ride continues, as in his short stay he has also been to see Port Power defeat Melbourne before a crowd of 28000 at AAMI Stadium and attended the after match function where Port coach Mark Williams offered him the chance to experience a training run with the club. Benji has already watched an Adelaide Crows session, and will be involved in Auskick clinics and learning about the day to day running of the Lyrup club. He's pictured at left with his favourite player, the Power's Byron Pickett. With the second International Cup to take place in Melbourne in early August, Benji has been named vice captain, behind Mtutuzeli Hlomela, another player with South Aussie connections. 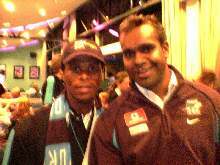 "Mtutu" spent a season with SANFL club Sturt in the under 19s back in 1998, also on a scholarship. From this contribution by the Double Blues 7 years ago, Mtutu has gone on to develop silky skills, founded a club in Soweto, and will take over as national coach for the Buffaloes when Steve Harrison finishes his work with AFL South Africa after the International Cup. If you think all the aforementioned achievements and experiences would be overwhelming for Benji, think again. Still only 21 years old, what was most obvious when meeting him in Adelaide were his clear goals and sharp attention to every detail of football. He was anxious for feedback on the style of games played during the Convicts tour, and had spent his time at the Port Adelaide match analysing the play - obviously he is the modern day footballer, where tactics are seen as important as the physical skills of the sport. Benji has many hopes for the future. Firstly he is determined to ensure that South Africa break through for their first international win at the upcoming Cup. He will then return to Lyrup (he's pictured at right with the team) for the remainder of the season, before heading home with plans to complete his final year of schooling. His dream then is to pursue sports management, with the hope of continuing the development of Aussie Rules, netball, handball and hockey. "The reason why I am choosing sports as my first priority is because sports has saved my life out of the streets". In fact this impressive young man goes so far as to say that the AIDS problem, devastating whole communities in his homeland, would be better fought with sport than the condoms which are now routinely handed out in a belated attempt to stop the disease (obviously both have a role). Benji sees sport as giving people hope and direction and as a key to encouraging healthier lifestyles and keeping kids away from dangers. He wants to develop sport from grassroots to fruits, that is give young boys and girls the chance to reach their full potential. It's an ambitious dream, and will need support from many people. One wonders how many other clubs out there like Sturt and Lyrup can help fast track the development of a young Australian Rules footballer from another country? How many Betty Lloyds might come forward to ensure the sport has an international future, while doing something positive to help struggling communities abroad?